West of the Byaduk caves, near the limits of the Harmans Valley flow, are a number of unusual clusters known as Lava Tumuli or blisters. These unusual circular mounds or hummocks of rock, up to 10 metres high and 20 metres in diameter, were caused by the pressure of the liquid lava flow beneath the thin crust of the lava tubes. These lava domes are considered to be unique in Australia and most likely rare on a world scale. Since most of the tumuli are on private ground, they are fenced it and can only be seen from some 100 meters away from Old Crusher Rd. It was not far away from Byaduk caves, so we decided to went there on our way to Melbourne. Tumuli location map. I made this foto in the Byaduk Caves. We stopped near the interception of Harpers Rd and Old Crusher Rd, as we were not sure where Old Crusher Rd is. The sign on the intersection pointed to the opposite direction, but after a short discussion we decided to turn to that road that seemed to be the Old Crusher Rd and after 3km of driving saw tumuli (when we went back we fixed the sign, so it pointed to the Old Crusher Rd). 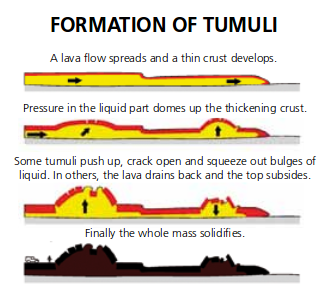 The tumuli look like small piles of rocks and came into existence when the lava pushed to the surface. As I said, this phenomenon is pretty rare — there are only 3 discovered sites on earth with such lava blisters. The sign was broken. I have no idea who did that. We took some photos and, finally, went back home. We made a short stop at Mt Rose lookout, near Pensurst, but sun had almost set and nothing could be seen around. Our first trip through Kanawinka Geo Park has successfully finished!